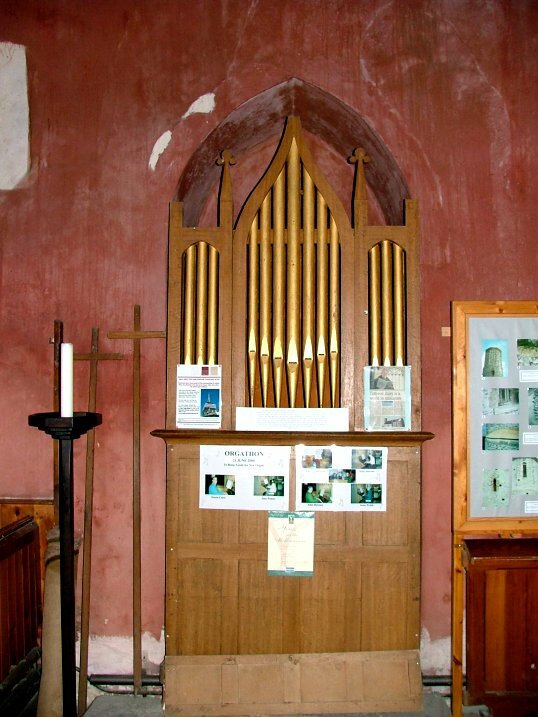 St Mary is only a mile or so from the sea, and it may seem perverse that one of the most easterly parishes in the British Isles is called West Somerton. 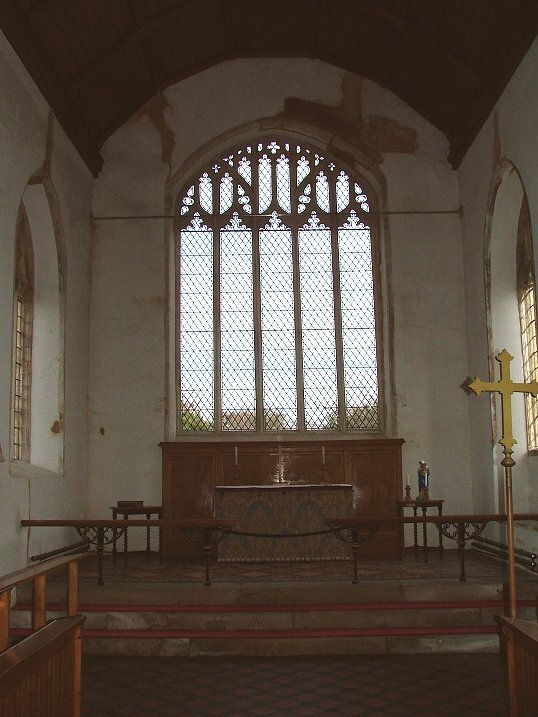 In fact, there is an East Somerton as well, although its parish was subsumed into that of Winterton centuries ago, and its former church is now a ruin in the woods surrounding Burnley Hall. Seen from the top of Martham tower on a crisp March morning, the woods and the sea form a pleasing backdrop to St Mary, as you can see on the left. The empty winter fields sprawl in front, with just the Hall farm beside the church to keep it company. What you can't see in the photo, because it is just out of sight to the right, is one of East Anglia's biggest wind farms, a dozen or so wind generators standing stately and proud between here and Winterton church. 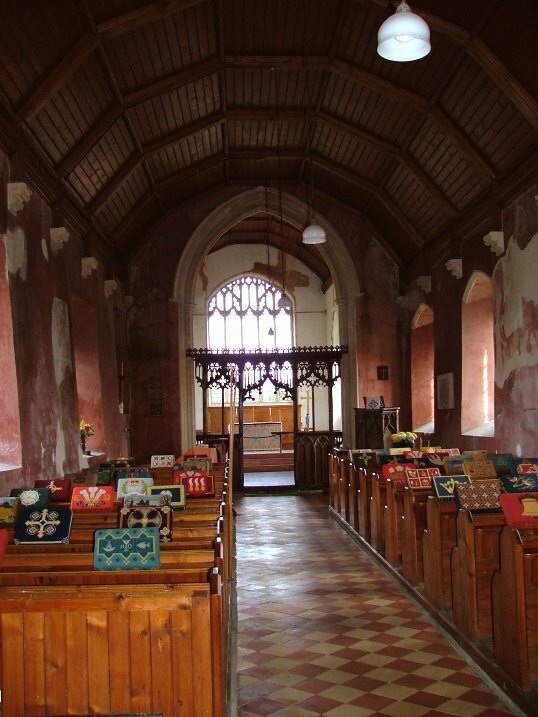 Many churches have what I have come to think of as a churchcrawler trail. You discover it when you try to take the best possible photograph of the outside. The place to take it may be in some overgrown corner of the graveyard, but when you get there you find a beaten track leading exactly to the spot you require. Someone has been there before you, and taken the same photograph already. 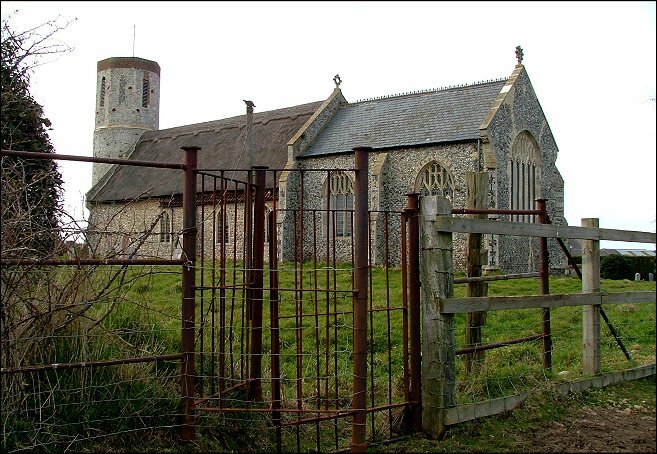 The churchcrawler trail at West Somerton leads through an old iron kissing gate in the south-east corner of the graveyard into the field beyond. A silver-grey pony stood there, watching me with a bored expression, as I pondered the best shot. Perhaps I wasn't the first person that day, but it would have been polite of him to show more interest. I found what seemed the place to stand, and asked the pony what he thought. Was this the spot? Or would he suggest a little to the left? He wrinkled his nostrils as if he really didn't care, so I dipped down, trying to make the shot mine by getting in the gate as well as the church. The pony shook his head sadly, and snorted. 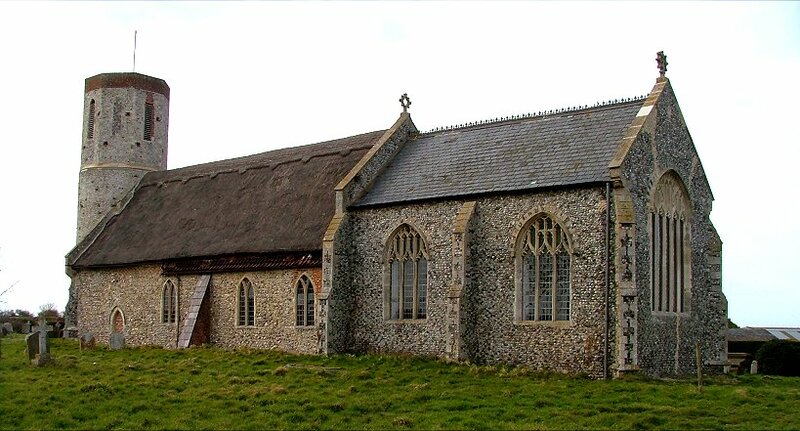 St Mary is an open, welcoming church on the edge of one of Norfolk's few areas of locked churches, which is a blessing, because there is something of great interest inside, as we shall see. 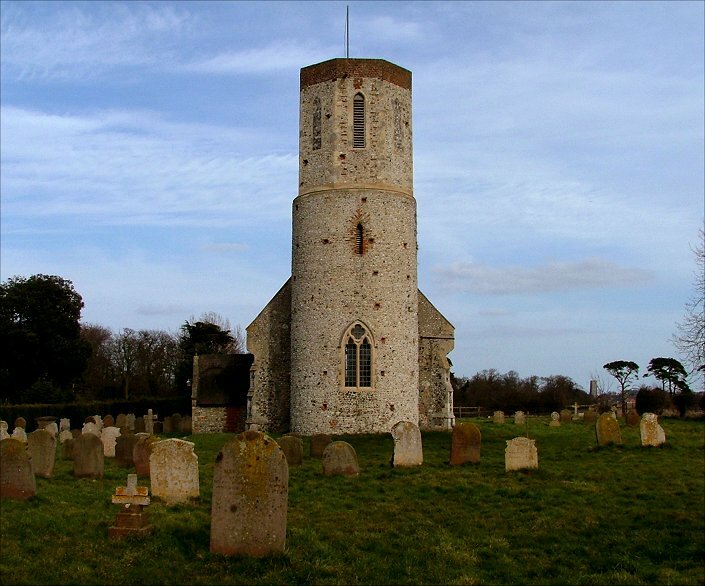 The church also attracts a fair number of tourists, because the graveyard is the last resting place of the Norfolk Giant, Robert Hales, who was seven feet six inches tall, and weighed thirty stone. 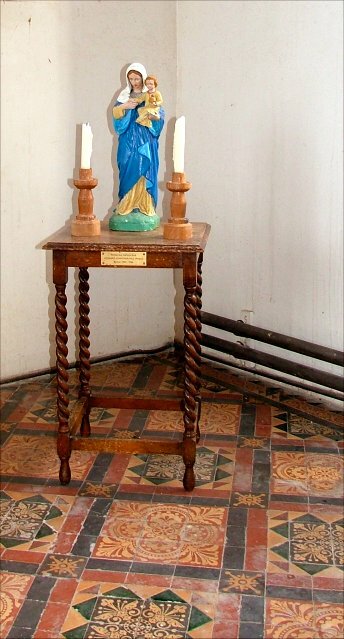 He died, aged fifty, in 1856, and this memorial was erected by his affectionate widow. 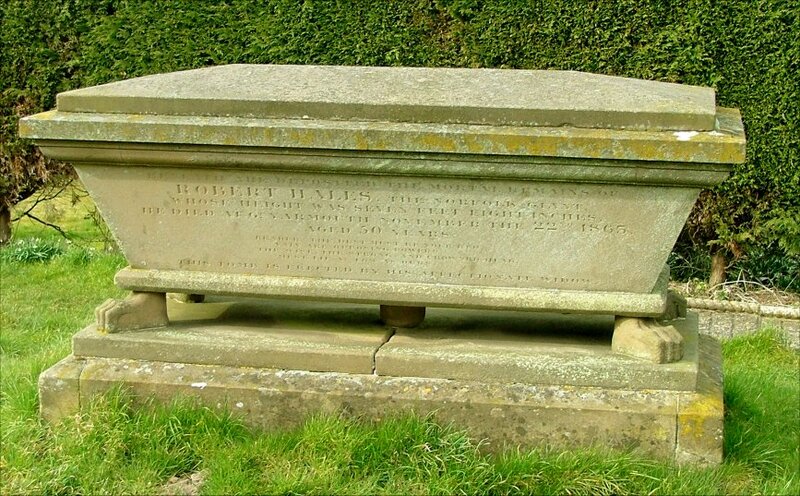 His tombchest is easily found on the northern side of the graveyard, and there is even a little viewing platform, with a path through from the Hall next door, so spectators needn't get their feet muddy. You can stand there and think to yourself my goodness, how on earth did they ever get his body inside it? 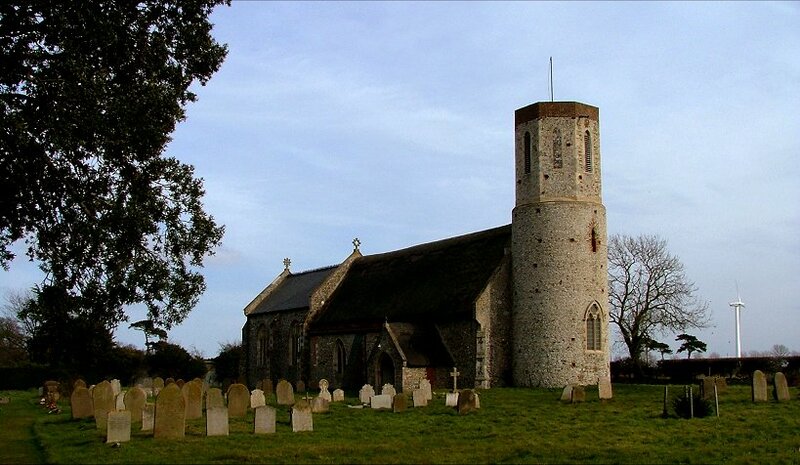 Turning from the graveyard to the church, St Mary has a rather curious aspect because it is one of the few East Anglian churches where the nave is early medieval but the chancel is late medieval. It is a useful reminder that the period from the Norman invasion to the Reformation lasted almost 500 years, as long as the difference between now and the reign of Henry VIII. 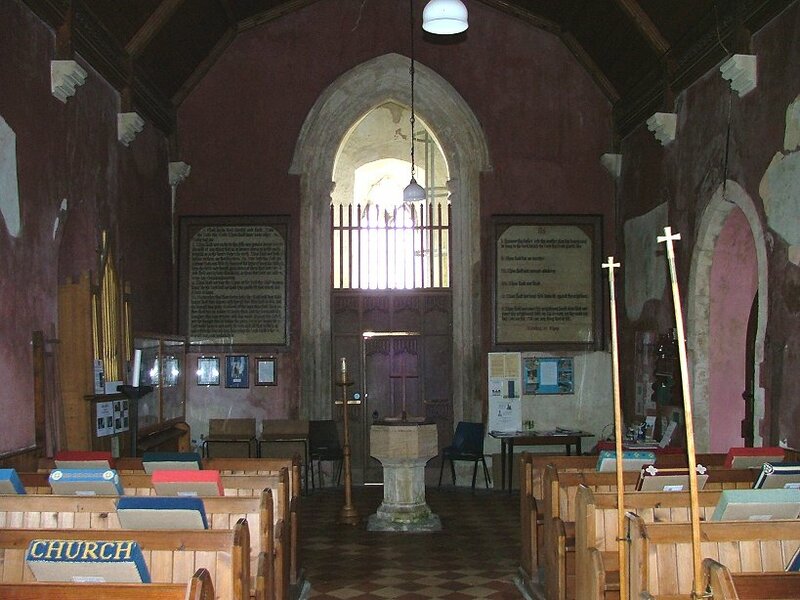 Perhaps 400 years separate the two parts of the church here; the Norman tower and contemporary rustic, thatched nave with its later Early English windows seem very primitive beside the crispness of the early 16th century Perpendicular chancel. 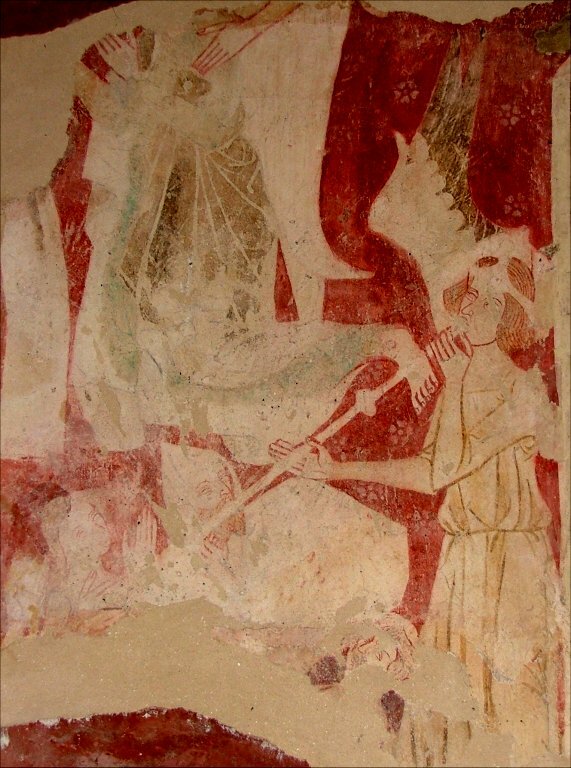 If the missing chancel of East Somerton's large late medieval church had been lifted by a giant and placed at the end of West Somerton's church instead, it would explain a lot. Stepping inside, the interior of the nave is rather tunnel-like, and the darkness is accentuated by the deep red of the walls. This is probably fairly authentic, and you begin to see the effects that Perpendicular architecture must have had on the imaginations of parishioners. They must have always thought of churches as dark places, and suddenly new architecture flooded them with light like a new theology. 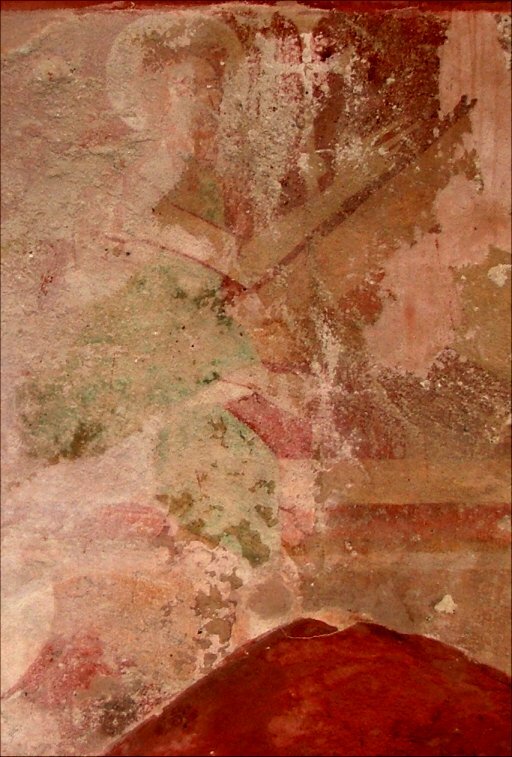 The windows are late 13th century, and contemporary with them was the scheme of wall paintings that still survive, in part. 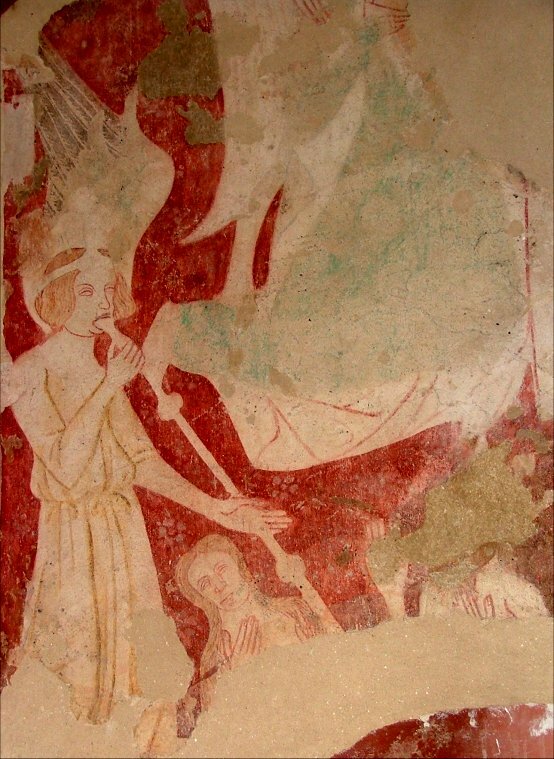 There is much more still hidden by plaster, but the best on show is part of a Last Judgement scene, with angels sounding the last trump on each side. 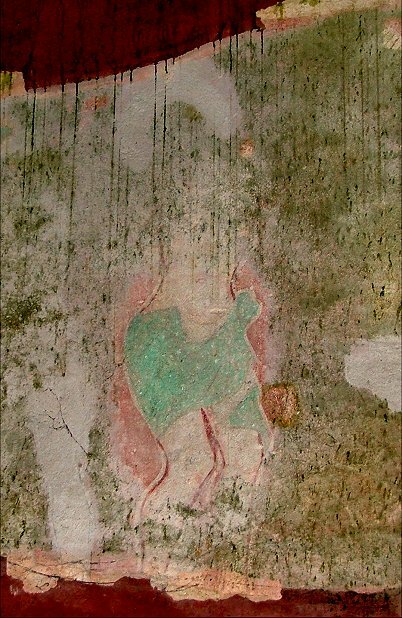 This is on the south wall, and to the north of it is part of a St Christopher, with vivid blue for his clothes. 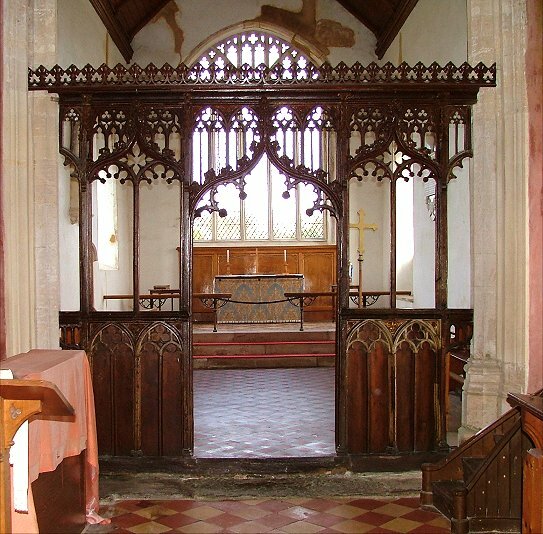 There's a pretty little rood screen, and you step through it into a chancel that is wholly different in character. In fact, its very crispness led me to think at first that it was a Victorian rebuilding. 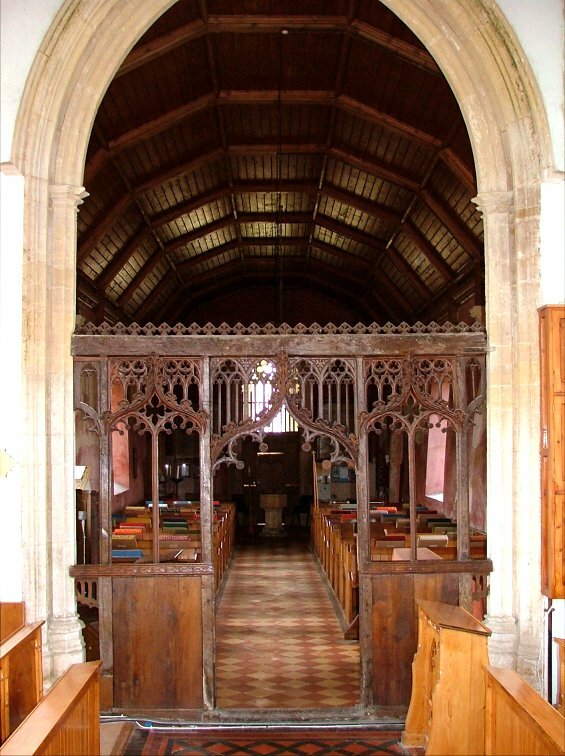 The Victorians are responsible for the tiling of the sanctuary, of course, and they restored its integrity to its medieval forms, but this is still a late medieval space, and a world away from the nave you have just left. It is as if they were constructed by two different cultures, which in itself is correct, of course. 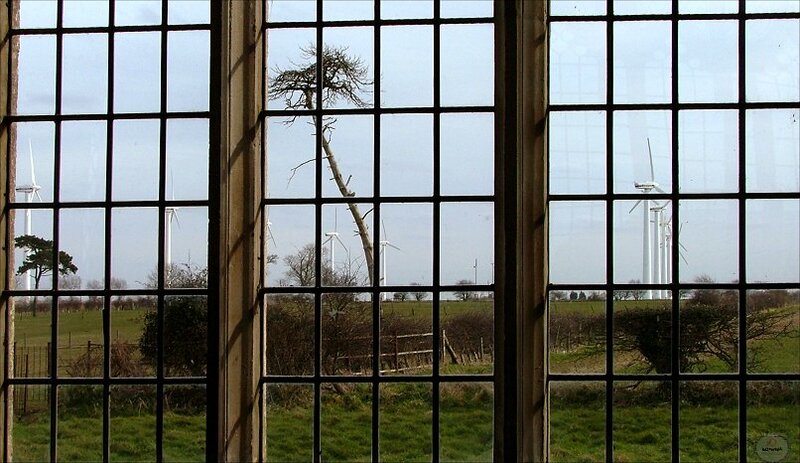 The view from the south chancel windows is a bit surreal, because among the trees are the vast wind turbines. The air felt still outside, but somehow they still managed to catch a breeze enough to whirl their mighty arms. People moan about wind farms, but I have never seen a wind turbine that was not beautiful. And they are completely silent as well, so it's a bit daft that people object to them on the grounds of noise. 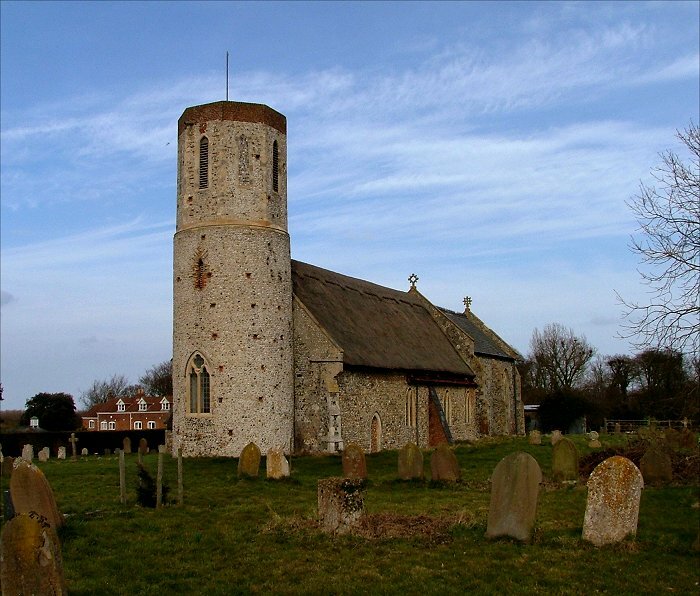 Norfolk seems to have taken to them with more enthusiasm than neighbouring counties, and at Swaffham there are two giants in the heart of the town. Wind turbines are dramatic and singular, mighty landmarks that enhance the landscape. We should have as many of them as we need.